Ahmedabad’s realty landscape continues to tread an unwavering path of stagnancy in Apr-Jun 2016 against the last quarter. The trend has been noticed for more than a year now. Localities towards the West seem to be the most active in terms of capital appreciation. Areas falling between the 100 ft Ring Road and the Sarkhej-Gandhinagar Highway grossed maximum capital appreciation Q-o-Q. Those recording the highest quarterly rise, by around six percent include Prahlad Nagar, New CG Road and Gota. While South Bopal delineated an almost stagnant market this quarter, it is touted to reap healthy appreciation in the future, primarily due to the presence of Grade A developers. 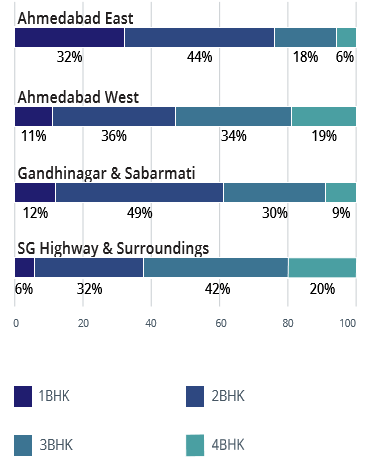 Ahmedabad’s rental landscape showed more promise than its capital market with average weighted values growing by three percent in the last one year. Localities towards the city centre garnered more traction. ‘Ask’ rates in Navrangpura towards the West and Maninagar towards the East spiked by 10-14 percent Y-o-Y. South Bopal, known for its affordable rental inventory, received high traction from the industrial workforces and posted a 10 percent increase in rental rates. Those seeking luxury dwellings with good connectivity opted for areas such as Thaltej and Jodhpur. With a growth of around 12 percent, these pockets scored over others due economic viability to Prahlad Nagar. 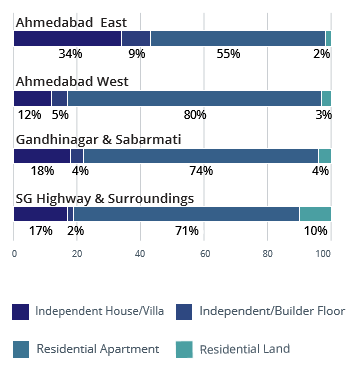 Ahmedabad’s realty landscape was majorly marked by disparities in the demandsupply equation. The city showcased a classic example of a mismatch between buyer’s expectations and developer’s offerings. The city garnered maximum demand and supply for residential apartments. However, the gradual shift towards the apartment culture has left the buyers of independent houses/villas with limited options in the city. The inventory of independent houses/ villas fell significantly short of its demand. Areas in East Ahmedabad and Gandhinagar registered maximum enquiries for this property type. Areas around SG Highway, too, witnessed a demand-supply mismatch for residential apartments and independent houses/villas. While supply of the former outstripped its demand, the inventory of the latter failed to match the market requirements. 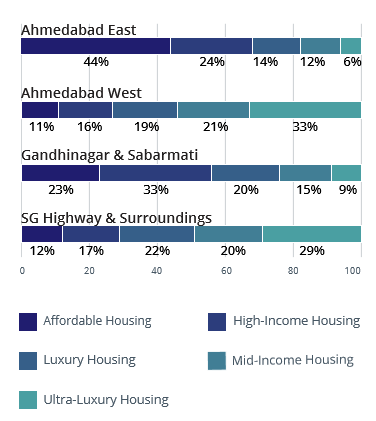 Ahmedabad’s realty landscape reflected a massive disparity between housing demand and supply in various budget categories. While homebuyers largely preferred properties within Rs 60 lakh, majority of the inventory on sale was priced beyond this. The mid-income housing category (Rs 25-40 lakh) witnessed the largest shortfall (11 percent) in supply with respect to demand. On the contrary, supply in the luxury housing segment (Rs 60 lakh to Rs 1 crore) significantly surpassed its demand, leading to plunging sales volume. Over-ambitious pricing and a large number of project launches in the premium category led to such a gap. 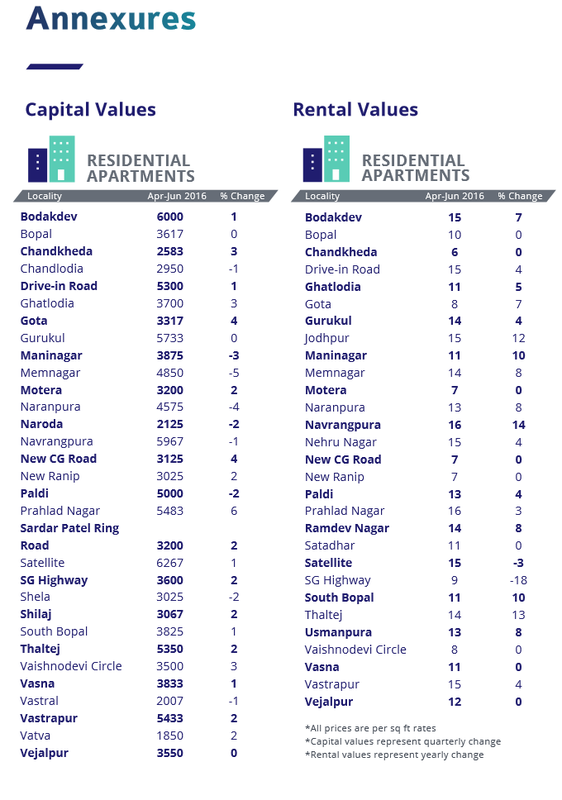 Properties configured as 2BHK units captured the largest market share (38 percent) in Ahmedabad in Apr-Jun 2016, against the previous quarter. However, its supply remained inadequate for the city’s appetite. 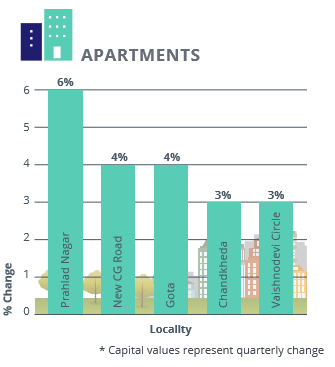 Almost half of the homebuyers in the city prefer 2BHK units over any other configuration. Demand and supply of 1BHK and 3BHK units remained almost balanced. However, supply of 4BHK units significantly surpassed its demand, indicating the inability of developer’s to gauge market requirements. More than half of the market share of 3BHK and 4BHK units is concentrated in areas around SG Highway, especially Thaltej and South Bopal. Maninagar and Naroda housed the maximum number of 1BHK units. 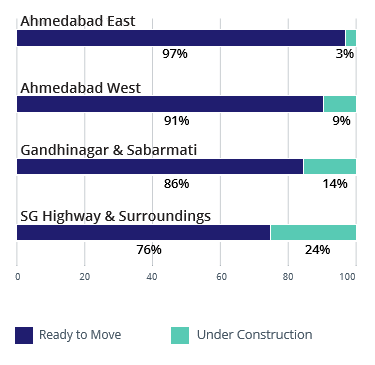 In line with the trend in other metros, homebuyers in Ahmedabad, too, are completely swayed towards ready properties. Almost nine out of ten buyers prefer buying a home which is ready to occupy. 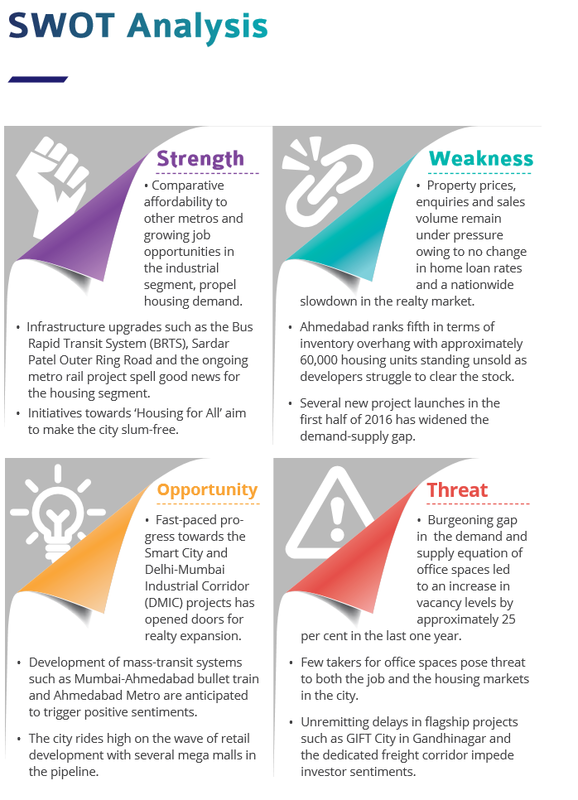 Though supply of ready properties does not meet the current market requirements, it is in sync with the demand. More than 85 percent of the total inventory on sale is ready for possession. 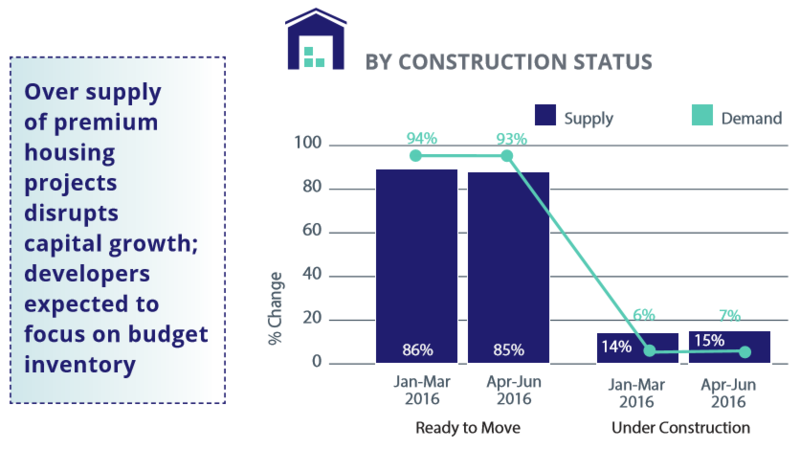 New launches in the first half of 2016 have resulted in a marginal hike in the supply of under-construction projects. Close to 70 per cent of the underconstruction projects are located in areas around SG Highway. South Bopal and Vaishnodevi Circle are currently witnessing robust construction activity.